The life of Farrokh Bulsara began on the East African island of Zanzibar on September 5, 1946. 25 years later in London under the name of Freddie Mercury he was fronting the now legendary rock group named Queen. The son of Bomi and Jer Bulsara, Freddie spent the bulk of his childhood in India where he attended St. Peter’s boarding school. He began taking piano lessons at the age of seven. No one could foresee where a love of music would take him. The Bulsara family moved to Middlesex in 1964 and from there Freddie joined up with a blues band called Wreckage while studying graphic design courses at Ealing College of Art. While singing for Wreckage, a fellow student introduced Freddie to Roger Taylor and Brian May, founder members of a band called Smile. Smile metamorphosed into Queen when Freddie joined Roger and Brian as the lead vocalist. The final member of the band, which was to stay together for the next 20 years, was bassist John Deacon, who joined the band on 1st of March 1971. The rest is rock history. EMI Records and Elektra Records signed the band and in 1973 their debut album Queen was released and hailed as one of the most exciting developments ever in rock music. The immortal operatically styled single Bohemian Rhapsody was released in 1975 and proceeded to the top of the UK charts for 9 weeks. A song that was nearly never released due to its length and unusual style but which Freddie insisted would be played became the instantly recognisable hit. By this time Freddie’s unique talents were becoming clear, a voice with a remarkable range and a stage presence that gave Queen its colourful, unpredictable and flamboyant personality. Very soon Queen’s popularity extended beyond the shores of the UK as they charted and triumphed around Europe, Japan and the USA where in 1979 they topped the charts with Freddie’s song Crazy Little thing Called Love. Queen was always indisputably run as a democratic organisation. All four members are each responsible for having penned number one singles for the band. This massive writing strength combined with spectacular lights, the faultless sound, a sprinkling of theatricality and Freddie’s balletic movements made up Queen on stage and on film. Through Freddie’s ability to project himself and the band’s music and image to the four corners of 70,000 seater venues they became known as the prime developers of stadium rock, a reputation perpetuated by their pioneering tactics in South America where in 1981 they performed to 231,000 fans in Sao Paulo, a world record at the time. They also became known as the key innovators of pop videos as their catalogue of 3-minute clips became more and more adventurous in style, size and content. Their phenomenal success continued around the globe throughout the 80’s highlighted in 1985 by their show-stealing and unforgettable performance on stage at Live Aid. In the mid 80’s, Freddie started concentrating on his solo career, which was to run in tandem with Queen (“the mothership”) for several albums commencing with the 1985 release of Mr. Bad Guy. Freddie’s much loved sense of self-parody reached a zenith with his cover version of The Platter’s song The Great Pretender in 1987, the video of which recorded him descending a sweeping staircase among acres of identical cardboard cutouts of himself. His first major collaboration outside of Queen was with Dave Clark for the recording of London’s West End musical Time, in 1986. This was followed in 1987 with the realisation of one of Freddie’s long-term dreams; to record with the world revered opera diva Montserrat Caballé. The LP’s title song, Barcelona went on to become an anthem for Senora Caballé’s home city and the theme for the Olympics in 1992. While most publicly recognised as the front man to one of the most progressive rock bands of the 70’s, Freddie defied the stereotype. A taste for venturing into new territories – a trait that was to have a marked influence on the direction Queen would take – took Freddie to explore his interests in a wide spectrum of the arts, particularly in the areas of ballet, opera and theatre, even taking a participating role: in October 1977 the sell-out audience of a charity gala at the London Coliseum organised by Royal Ballet Principal dance Wayne Eagling received the surprise of an unannounced appearance by a silver-sequinned leotard-clad Freddie performing an intricate routine choreographed for him by Eagling. In 1987 he made a one-night appearance in Dave Clarke’s Time at the Dominion Theatre, although legend has it Freddie occasionally turned up at the theatre to support friend Clarke’s musical, one night selling ice-creams in the stalls! Freddie would have loved the fact that The Dominion palyed host to the band’s phenomenally successful musical We Will Rock You which ran for 12 years. Freddie returned to the studios to record Innuendo with Queen in 1990. On November 24th, 1991, Freddie’s struggle against AIDS ended when he passed away just over 24 hours after he had publicly announced he had the disease. Musicians and fans from all over the world paid their highest respects as the passing of rock’s most innovative, flamboyant ambassador signified the end of an era at the Freddie Mercury Tribute Concert at Wembley Stadium on April 20, 1992 which gave birth to the Mercury Phoenix Trust, the AIDS charity set up in Freddie’s memory by the remaining members of Queen and Freddie’s Executor, Jim Beach. Freddie Mercury, who majored in stardom while giving new meaning to the word showmanship, left a legacy of songs, which will never lose their stature as classics to live on forever. Some of the most poignant of these were immortalised on the Queen album Made In Heaven released in November 1995. The sleeve of the album shows a view from Freddie’s Montreux home. Despite twenty years having passed since Freddie lost his life to HIV complications, he remains in the minds of millions throughout the world as one of the greatest artists we will ever see. In September 2010 (coincidentally, around Freddie’s 64th birthday) a poll carried out among rock fans saw him named the Greatest Rock Legend Of All Time, beating Elvis Presley to claim the title, and ahead of David Bowie, Jon Bon Jovi, Jimi Hendrix and Ozzy Osbourne. A spokesman for OnePoll.com which conducted the poll said: "Freddie Mercury had it all, the voice, the image, the stage presence, everything. September 5, 2010 saw The Mercury Phoenix Trust launch Freddie For A Day, a major annual initiative designed to celebrate Freddie’s life each year on his birthday and to support the on-going work of the Trust. 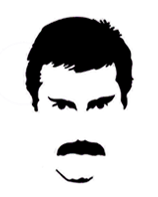 The project encourages fans to dress as Freddie for a day and in doing so raise funds for MPT through sponsorship. No one could have imagined the extraordinary response which resulted, with fans from 24 countries around the world, from Argentina to Ukraine, seizing on the idea to pay their own special tribute to Freddie. Some sent pictures strutting their stuff at home, singing into a microphone in their bedroom. Others took the plunge and spent the whole day as Freddie, including one US enthusiast who dressed herself as I’m Going Slightly Mad Freddie and then spent her day at the local mall and then at Columbus Zoo in Ohio with a penguin and a gorilla. Another took a TGV trip from France to Switzerland dressed in a harlequin leotard. The stories of extraordinary and fun days spent come in their hundreds, and as a result, Freddie For A Day is now an annual event. Taking it one stage further, Freddie’s 65th birthday, September 5, 2011 was celebrated with a major party in London in aid of The Mercury Phoenix Trust, hosted by Queen’s Brian May and Roger Taylor. A major Hollywood movie about Freddie and Queen, produced by GK Films, Robert de Niro’s Tribeca Productions and Queen Films is expected to start shooting shortly. Freddie Mercury’s life continues to be celebrated each year through a Mercury Phoenix Trust produced Official Fan Party that is held on his birthday and held in his honour in Montreux, Switzerland.